I love to bake. But you all knew that already didn’t you? Today I’ve had a baking-evening with Ellen. We were going to bake Christmas-cookies. I don’t like that many Christmas cakes. The only two I like I don’t know how to make. These, which is called Serina cakes, I made for mum. She has enough to bake already so I thought it was nice to bake some for her. I always bake these before Christmas. Stirr the butter and sugar until it’s “white”. Add the egg. Mix the dry ingredients and add it to the dough. Make round little balls. Place them on a plate. Push them down with a fork. 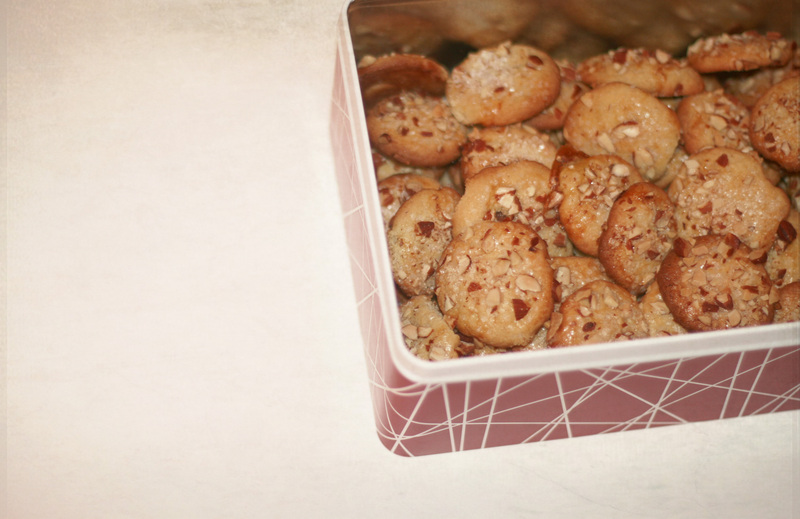 Brush the top of the cookies with albumen and sprinkle sugar (pearl sugar) and chopped up almonds on top. In the oven for 10 – 20 minutes (depends on the size of the cookies) at 190 degrees celcius. Ellen baked some cookies I don’t remember the name of. It is traditional Christmas cookies. We had a lot of fun baking. I was ready way before her, since I had made the pastry days before, so I helped out Ellen with her cookies. After baking for a few hours, we made dinner – pasta. Yum! It was delish. We watched Nanny 911 and half of Extreme Makeover, Home Edition. I had chocolate for dessert after Ellen left. When I think about it, I’m still eating chocolate.